A recent visit with friends to Eight Bar and Restaurant on Dock Road, Galway was a great success (perhaps it was bound to be when the drinks bill was the same as the food bill – but enough of that!). This restaurant is dedicated to using local, seasonal produce with all suppliers credited on the menu. The menu is divided into three sections; Light Bites (starters) ranging in price from c. E6 – E10, Bigger Bites (mains) c. E18 – E23 and After Eights (desserts) c. E6.50 or a cheese board at E11.50. There is also a daily cocktail on the menu (E6.50) and given that we were four girls who love “pink fizz”, we had to start with a round (or two!) of prosecco with strawberry puree. The wine list is short (but perfectly formed) and each variety is available by the glass which I always like to see. We chose a lovely bottle of Chablis which was well priced at E28. One of our party had a glass of Rioja with her main course and this was also well received. We ordered three starters; two of the party having the same – Crusty ciabatta with organic hummus, olives and greens and two of us sharing a Puff Pastry with chorizo, goats cheese, apple and walnuts. Both were exceptionally good and were very well presented. For mains, a Sirloin steak, Parmesan Crusted Duck Leg and two Beef curry’s with couscous were ordered. Again all three dishes were winners and were thoroughly enjoyed. I had the duck leg and it was wonderful and came with duck fat roast potatoes, pickled cabbage, black pudding and hazelnuts. Oh and a special mention for the side order of thrice cooked hand cut chips! These were amazing and worth going to Eight for on their own – very moreish indeed. After all that, none of us were able for dessert but I will definitely be back to try the “After Eights” – and hopefully soon. The bill came to E214 for four of us which was good value for all we had. Thanks to Shane and his team for a wonderful evening. Eight really is a triumph! Postscript: A return visit to Eight was equally as good. 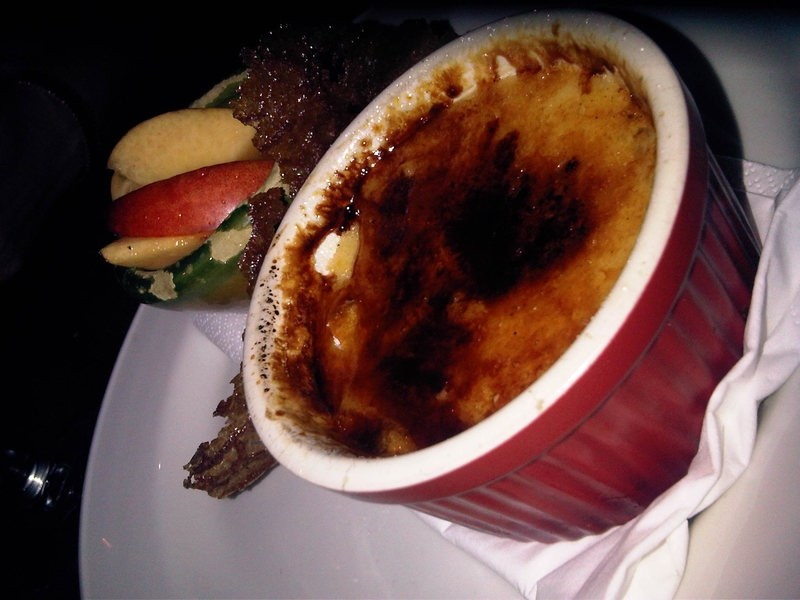 This time, we managed a dessert – a wonderful Creme Brulee. Eight really is a gem, love it! Second Postscript: This wonderful restaurant has unfortunately closed its doors. It is a real loss to the restaurant scene in Galway and is sorely missed.